TORONTO - The Canadian dollar was at its lowest level since March on Monday morning, while the greenback strengthened on speculation about when the U.S. Federal Reserve may start to raise interest rates. The loonie was off 0.04 of a cent to 89.61 cents US following a loss of 1.7 per cent last week. Markets have generally looked for the Fed to raise rates around the middle of 2015. The greenback also found support as revised official data on Friday showed the world's largest economy expanded at an annual rate of 4.6 per cent in the spring — the fastest pace in more than two years. But traders are looking for reassurance that job growth is also showing similar strong advances. Markets looked for the U.S. government to report that the economy created about 210,000 jobs during September. And it is possible that the disappointing August report will be revised upward. Canadian job figures for September come out Oct. 10. Traders also focused on the latest reading on the health of the Canadian economy. Statistics Canada is expected to report Tuesday that gross domestic product rose 0.3 per cent during July. A major deal in the energy sector could also prove to be a weight on the Canadian currency in the coming weeks. Encana Corp. (TSX:ECA) is buying American resource giant Athlon Energy in a US$7.1 billion cash deal that will give the Canadian gas producer access to a major Texas oil play and speed up its shift towards more liquids production. 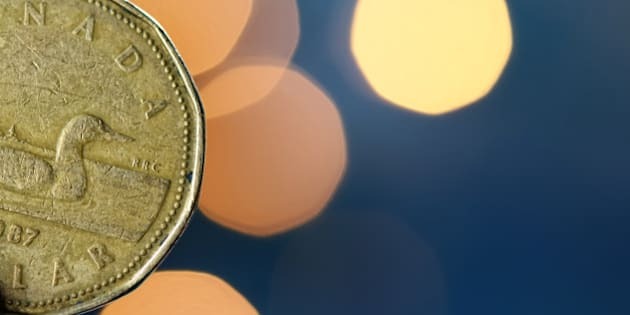 Camilla Sutton, Chief FX Strategist, Managing Director Scotiabank Global Banking and Markets, said the deal "could imply a large Canadian dollar negative flow leading into mid-December when the deal is expected to close." On the commodity markets, the November crude contract on the New York Mercantile Exchange slipped 35 cents to US$93.19 a barrel, December bullion gained $7.10 to US$1,222.50 an ounce and December copper was unchanged at US$3.03 pound.